The only desk you'll ever have to buy for your child, the Moll ergonomic desk is designed to adjust to your child's growth. The desk height and tilting desk surface are easy to position to just the right fit. 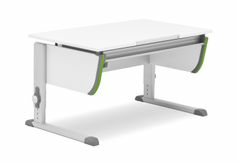 Well loved around the globe for comfort and quality, Moll ergonomic kids' desks are now available in the U.S. We stock the popular Champion Desk and Joker Desk at our Amherst, MA warehouse, and it is available for immediate shipment. 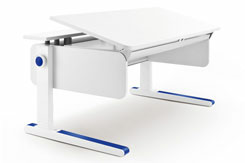 We can also special order other popular Moll Desk models including the new Winner Desk and Winner Compact Desk for you. Save hundreds of dollars by buying just one desk to last from preschool to high school. With Moll products you don’t need to worry about cluttering your home with furniture your child has outgrown. You get to buy once and use for a lifetime. Children spend a good part of the day sitting. 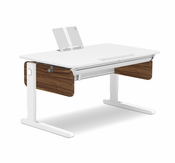 Moll ergonomic desks enable healthy posture and reduce neck strain. Moll kids' desks adjust to fit your child's individual needs perfectly.